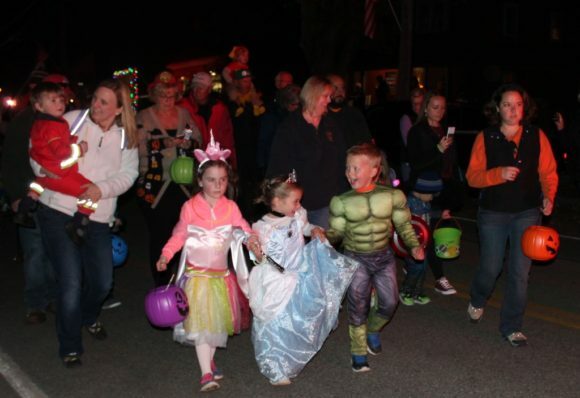 LYSB Hosts Traditional Halloween Party Tonight Prior to Costume Parade Down Lyme St.
You are here: Home / Towns / Old Lyme / LYSB Hosts Traditional Halloween Party Tonight Prior to Costume Parade Down Lyme St.
Last year’s Halloween parade down Lyme Street drew all sorts of characters! It’s a tradition that’s been going more than 20 years! Tomorrow evening, Lymes’ Youth Service Bureau will host a Halloween Party for children ages 12 months through 2nd grade from 5 to 6 p.m. This is a free, fun family event offering games, crafts, photo booth fun, face painting, and more. All “little goblins” must be accompanied by an adult. The traditional costume parade will then leave the firehouse at 6:15 p.m. when all party participants are invited to march down Lyme Street behind a fire truck. Here’s wishing all our readers a safe and Happy Halloween!